The TBE transfers load from the truss or girder to plates for bearing-limited conditions and provides exceptional uplift capacity. It replaces nail-on scabs that provide lower load transfer, or in some cases, an additional ply when needed for bearing. One size works with any number of girder plies. The table lists allowable loads for TBE4 used on 2x4 and TBE6 used on 2x6 top plates. 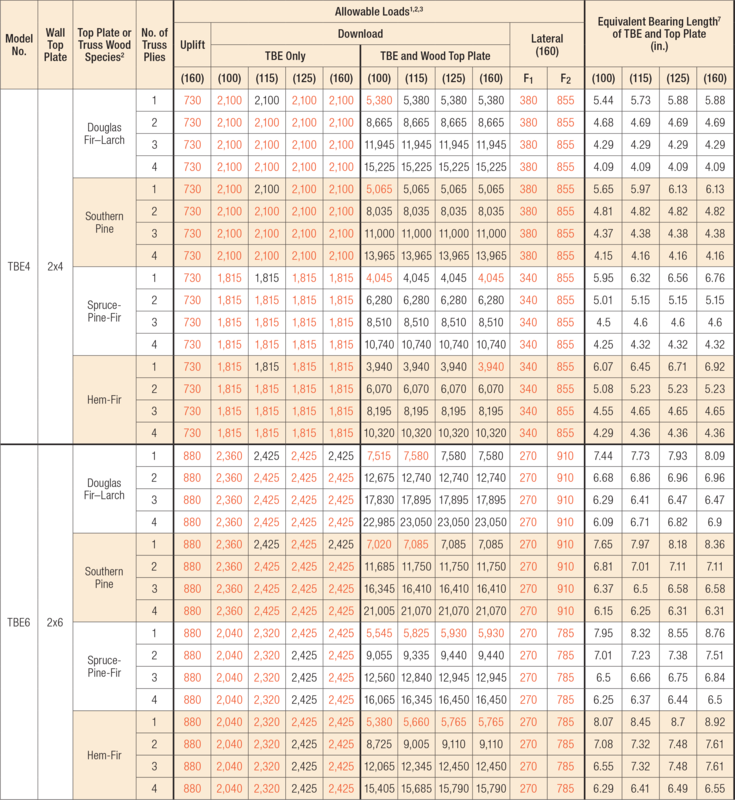 The table gives the different loads calculated for TBE with and without wood bearing. See Fastener Schedule and Alternate Installation tables. TBE must be installed in pairs. 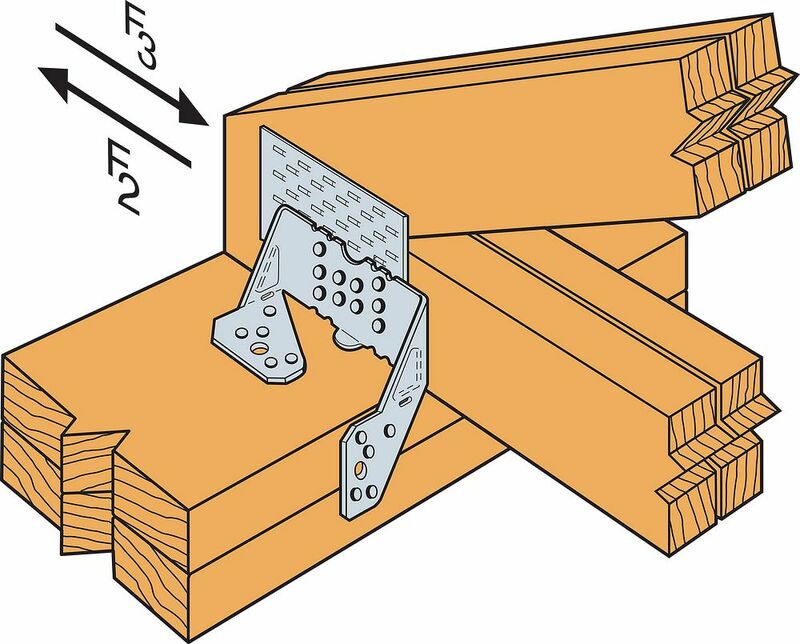 Top-plate size is 2x4 for TBE4, 2x6 for TBE6. Use alternate installation for TBE4 and TBE6 on larger plates or pre-sheathed walls. See alternate installation table. Loads are for a pair of TBEs. 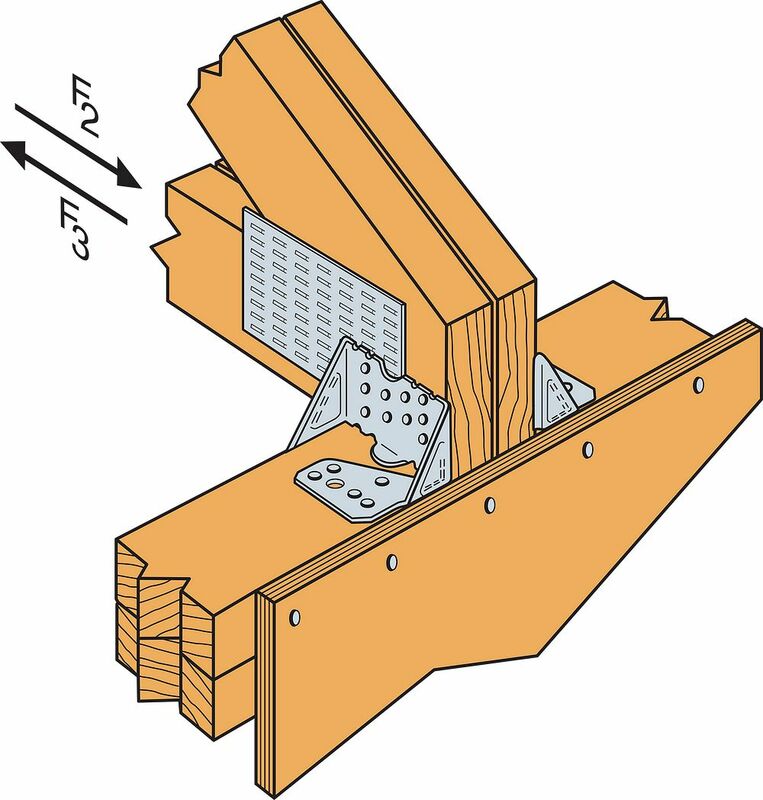 When truss chord wood species is different from the wall top-plate wood species, choose the tabulated allowable loads based on the species with the lower tabulated download capacity. Uplift and lateral loads have been increased for wind or earthquake loading, with no further increase allowed; reduce where other loads govern. 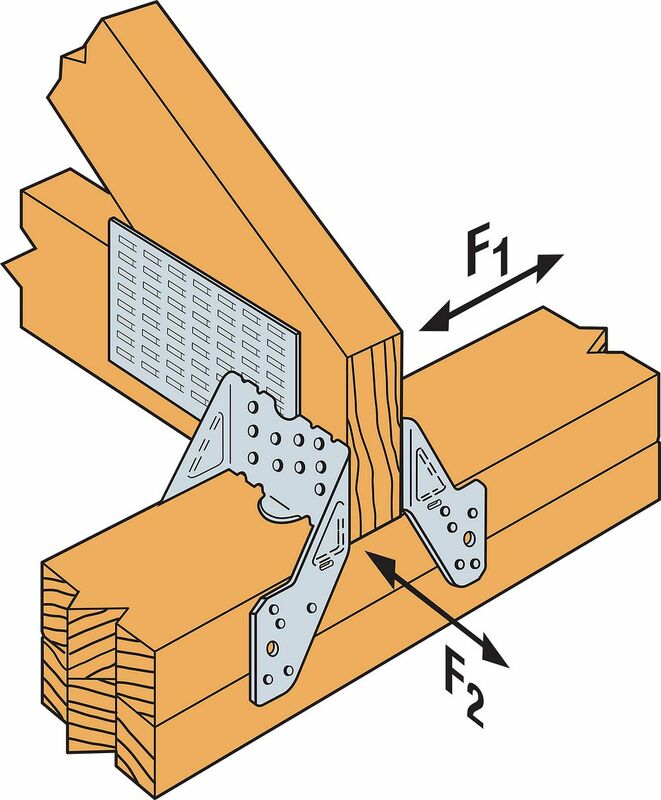 Allowable loads are determined only by nail shear calculations or tests of the metal connectors based on the lowest of 0.125" of deflection or the ultimate load with a safety factor of 3. 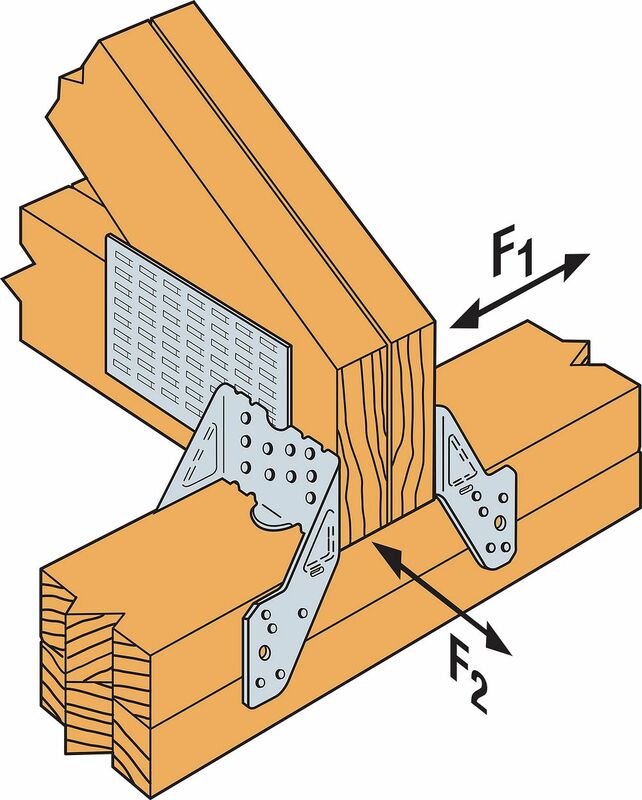 The attached wood members must be designed to withstand the loads imposed by the nails. 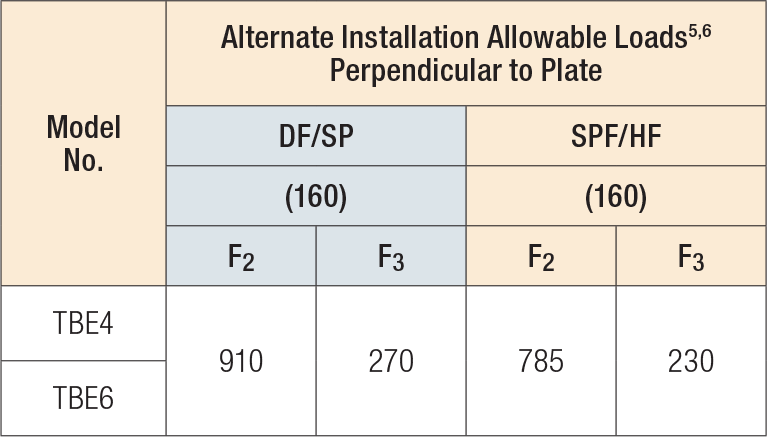 Perpendicular-to-Plate loads are reduced for Alternative Installation. Parallel-to-Plate loads are not reduced for Alternative Installation. The width of bearing wall required to provide the same bearing capacity as the TBE Allowable Load (TBE and Wood Top Plate) is referred to as the Equivalent Bearing Length. Use full table loads for uplift and parallel-to-plate allowable loads. Download capacities are 0.80 of table loads. See additional footnotes in the table above. Pre-sheathed shearwall. Bend tab along slot and nail one leg to top of the plate. TBE See specific model numbers for code listings.